This antique petite bergere and ottoman in distressed white paint, add perfect elegance to a small sitting area. The curvature of the armrests and matching ottoman makes this adorable couple quite unique. Carved columns in the front of the chair signals the craftsmanship, thought, and planning that went into the design of this duo. 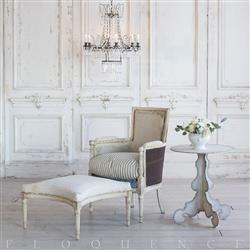 Classic and very slender renditions of Louis XVI fluted legs and carved flowers.